Hello everyone. Thank goodness it's the weekend. I've got a very full couple of days in the craft room, so steam will be coming off my scissors!!! Hope you all get some time to get crafty this weekend, and of course after the weekend comes Monday, which is when you can all get Sheena's new stamps and folders. Here is another one of my samples. 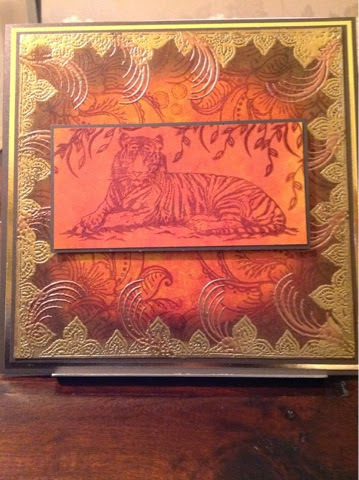 I made this one quite rich in colours, and when I used a matt embossing powder on the tiger, it felt a bit like flock, which I liked. Anyway, have a lovely weekend and thanks for stopping by.